This small quilt is made with 6" Cracker quilt blocks. The blocks can be sewn into groups of four to make the final layout easier. Be sure to look at the last two pages of the pattern for additional layouts options before you sew quilt blocks together. A design wall will help you choose a layout. 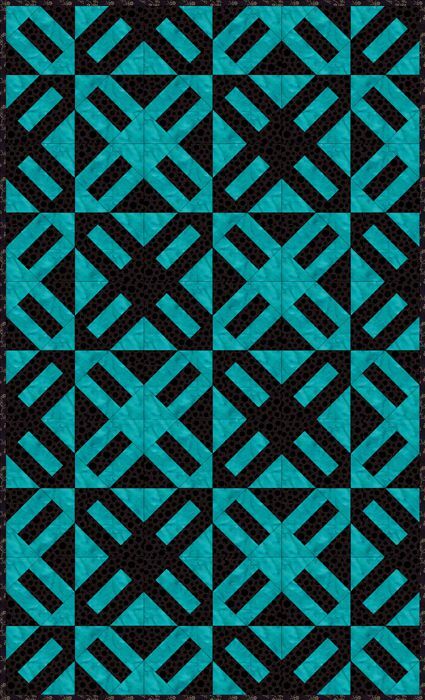 Only two fabrics are used for the Cracker quilt blocks, a black print and a turquoise blue mottled fabric, but you can sew with additional fabrics, and may prefer to make a scrap quilt from the pattern. When using two fabrics, you'll need about 1-1/4 yards of each. Finished quilt size: 36" x 60"
Cracker quilt blocks are made up of patchwork bars with triangles at their ends. The two block variations used are in opposite color layouts -- see pages 2 and 3 for examples. Cut fabric for a sample block or two before cutting all of your fabric. See page 2. Sew a long turquoise strip lengthwise to each side of a black strip. Press the seam allowances towards the black strip. Square up one end of the strip set and then cut as many 4-3/4" segments from it as possible, starting at the squared up end. Make additional identical strip sets until you have 30 bar segments with turquoise strips on both outer edges. Center and sew a turquoise triangle (cut from 3-7/8" squares) to two ends of the bar unit, arranging it to sit across the ends of the bars. Press the seam allowance towards the triangles. Sew a black triangle to the remaining two sides of the unit. Press seam allowances towards the triangles. Assemble 30 identical Cracker quilt blocks. Next, make strip sets with black fabric on their outer edges. Sew a long black strip lengthwise to each side of a turquoise strip. Press the seam allowances towards the black strips. Your Cracker quilt block should measure 6-1/2" x 6-1/2". Make additional identical strip sets until you have 30 bar segments with black on the outer edges. Center and sew a black triangle (cut from 3-7/8" squares) to two ends of the bar unit, arranging it to sit across the ends of the bars as shown. Press the seam allowances towards the triangles. Repeat, sewing a turquoise triangle to the remaining two sides of the unit. Press seam allowances towards the triangles. Assemble the 4-block units shown above if you plan to make the quilt illustrated on page 1. Gather two of each Cracker block type. Arrange the blocks into two rows as illustrated, with like blocks on the diagonal from each other. Sew blocks in each row together. Press seam allowances towards the blocks with black bars on their outer edges. Join the rows, butting seams for a perfect match. Repeat, making a total of (15) 4-block units. Refer back to page 1. Arrange the large blocks into five rows, each row with three blocks. Notice how the blocks elements link together and take it one row at a time. Sew blocks in each row together. Press new seam allowances between adjoining blocks in opposite directions. Join the rows and press. Binding: about 220 running inches of doublefold binding strips that finishes at 1/4". Quilt Backing: about 42" x 66". Quilt Batting: about 42" x 66"
This scrappy Cracker quilt layout is created by arranging quilt blocks in groups of four to create an "O" shape, and then sewing the groups side by side in horizontal rows. This Cracker quilt layout differs slightly from the block arrangement you saw on page 4. Here, blocks are still arranged in groups of four, but some groups create an "O" and others create an "X." The layouts illustrated are just two of the many possibilities for arranging Cracker quilt blocks.